Back in the 1980’s interview with Bill Gates and Steve Jobs, Bill Gates said a very quick comment about what he thought the future world of technology would look like. He said very small personal touch screen “tablets” would be used by most people for daily tasks including mobile communication, phone calling, and entertainment. He said a tablet would be the perfect “go to device” between your phone and your computer. In that eventually your phone and computer would be intertwined into one single device.. an Android Tablet. In 2011 you will be awestruck about how many Android Tablets will be in on the market. For the majority of 2010 most of the tablets on the market were manufactured from Chinese companies, that the masses in the U.S and Canada did not have direct access to. Although in later 2010… more and more of these Android Tablets started to be sold to U.S and Canadian markets. Plus with the influx of tablets from Dell, Samsung et al.. more and more people started to purchase these devices. Just as Bill Gates predicted in the 1980’s. Why should I buy an Android Tablet? At first the majority of people purchasing Android Tablets were technophiles or technology geeks at heart. Although this tide is turning and the main stream consumer is now jumping on board. A tablet is a great device, as it’s light-weight, can feature more than a 1GHz processor, can read eBooks, can view the web and email, plays games, plays music, you can watch video, and so much more. 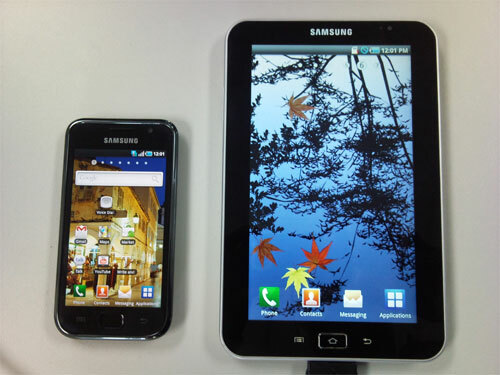 Plus with Android Tablets such as the Samsung Galaxy you can use it as a phone. Simply bring along your tablet, and make phone calls just as if you had your cell phone. Tablets are perfect devices if you want to surf the internet, check your emails, contact your social network friends… without lugging around a 6lb laptop. Yes netbooks… are also popular, but the world is going to “touch screen”. Keyboards… the old QWERTY slide-outs are becoming a thing of the past. A lot of media attention is focusing on the Apple iPad… which does make sense. Although what a lot of media people do not know, what tech people do know, is that Android Tablets will be the real “iPad Killers.” In 2011 the market will be flooded with Android Tablets, which will only drive the price down for consumers. Don’t be surprised to see higher-end tablet manufacturers starting to sell their tablets for under $300.00! For more information on buying an Android Tablet, kindly click on this link to view our section on purchasing Android Tablets.